The Isis–isn’t this an exotic sounding name? How about Bijou, Rialto, Majestic, Palace, or Regency? What images do these names bring to mind? Movie theater owners in the 1910s thru the ’20s wished to evoke the mystery of the exotic or the pomp and privilege of royalty in both the name and design of their theaters. Names such as “Bijou”, the French word for jewel; “Granada”, a city in Spain; or “Rialto”, an Italian island, stimulated the imagination, convincing the public that when they passed through those theater doors, they were embarking on a thrilling adventure. Movie theaters became garish, dazzling and grand palaces. Those were exciting times for the fledgling film industry. Americans fell in love with moving pictures right from the start. But the earliest cinemas, in a period from about 1905 to 1912, were small neighborhood store fronts. A movie theater opened in Pittsburgh in 1905 that was cleverly called The Nickelodeon. The name is a combination of nickel (the amount charged to get in) and “odeon”, the Greek word for theater. By 1907, about 4,000 of these small nickelodeon cinemas were scattered around the U.S. The shows were a series of individual movies each only several minutes long, cobbled together to fill a half hour program accompanied by music. People flocked to these shows, almost in a frenzy. From eight in the morning until midnight visitors streamed in and out as nickels filled the box office coffers. Viewers were spellbound. Isis was the name give to the mission-style, single-screen theater built on the southwest corner of Ojai Avenue and Signal Street in the town of Nordhoff in 1914 (Nordhoff’s name was changed to Ojai in 1917.) Isis is an Egyptian goddess, and for reasons unknown her name became a popular one for movie theaters in the United States. Cinema Treasures, a non-profit group dedicated to recording the history of American theaters and providing a forum for their preservation, lists on their website over 20 theaters named Isis in the United States built during this period. However, most are now closed or demolished. Others, like Ojai’s, may have undergone a name change. A newspaper ad indicates there was an Isis Theatre in Ventura. During World War I, the U. S. film industry began to dominate as European countries were preoccupied with war. The development of the studio system in California, with its center in Hollywood, and the promotion of actors and actresses as movie stars further propelled the United States into the lead in the 1920s. Silent film era stars such as Charlie Chaplin, Buster Keaton and Douglas Fairbanks became known around the world. With the advent of “talkies”, Hollywood entered into the “golden era” of film-making during the 1930s and ’40s. Every town in America had to have a movie theater and the towns of Ventura County were no different. Oxnard, Santa Paula, and Ventura had quite a few over the years – most of them now long gone. The oldest remaining theater in Ventura is the downtown Majestic Ventura Theatre that opened to great fanfare in 1928 and now is a concert venue. Ojai and Fillmore today have the oldest movie theaters in the county. The single-screen Fillmore Towne Theatre opened as the Barnes in 1916 and is now owned by the City of Fillmore. The Isis Theatre was built by John Joseph (known as J.J.) Burke on the corner occupied for twenty years by The Ojai newspaper office and print shop. Houk’s ice plant and butcher shop were also on this corner. The newspaper building was moved a short distance south on Signal Street (across from where the post office parking lot is today) to make room for the new theater. According to an article in The Ojai of May 1, 1914, the redevelopment of the corner was considered a remodeling of the entire building, though in fact the building was practically new and enlarged. Walter Houk also built a new ice plant at this time. According to the article, a large oak tree at the site was cut down to make room for the expanded project. The finished building contained the new theater and Houk’s meat market and ice plant. The Ojai of May 29, 1914 describes the project, “The new building will be 32 feet on Ojai Avenue and 75 feet long on Signal Street. The style of architecture is to be Mission. A big Mission front will cover this and W.E. Houk’s meat market. The outside of the walls will be plastered, and the interior finish will be pressed tin–very ornamental and attractive, and will make the building practically fire proof. A polished maple floor has been decided upon, so that with moveable chairs, the place will make an ideal hall for dances.” The theater was built for vaudeville shows, dances, lectures and to show movies. Ojai’s 1914 Isis edges out the Fillmore Towne Theatre in age by two years. The Isis wasn’t grand but for this small, rural village it was a triumph. The first film shown was The Valley of the Moon on August 19, 1914 based on the Jack London novel. The Ojai, August 14, describes the event, “This will be the first showing of this photoplay in any small town in California, and being one of the most expensive productions, our people should congratulate themselves upon being able to see it. All the scenes in this picture are taken in California, around San Francisco Bay and beautiful Carmel by the Sea.” Admission prices were: adults 20 cents and children 10 cents. E.A. Runkle managed the theater in the early years and presented two regular shows a week, on Wednesdays and Saturdays. After the Saturday show the chairs were moved aside for dancing. Claude Munger cranked the primitive projector while the impromptu piano player kept pace by watching the film. The piano players were E.A Runkle’s wife Ethel and Claude’s sister Marion Munger. 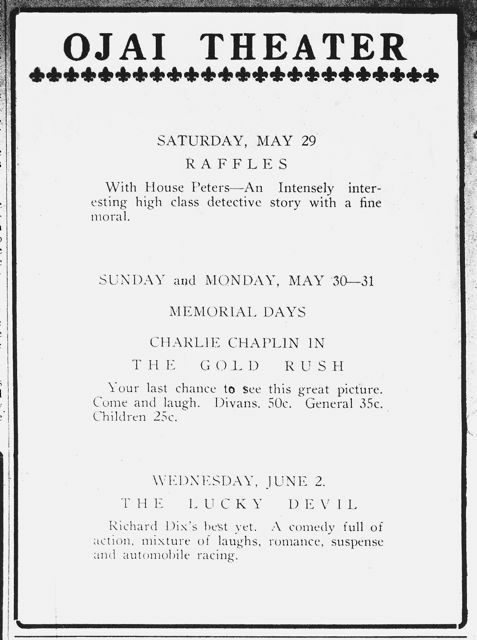 Movie ads in the local paper were profuse and filled a half page at times. Fred and Lidie Hart bought the Isis from J.J. Burke in 1926 and reopened it as the Ojai Theatre. changes: “The walls have been redecorated and now present a beautiful and harmonious appearance. Soft shades of pink have been used on the walls, attractive boxes decorated with designs of flowers and ferns have been made for the indirect lights and additional side light with soft shades. For the greater comfort of guests Mr. Hart has installed 42 of the finest divans obtainable. There are three rows of them and they have been installed on raised platforms to give entirely unobstructed vision. The two new projecting machines are giving great satisfaction and will add considerably to the enjoyment of patrons.” Shows were given on Mondays, Wednesdays and Fridays with Mrs. McCaleb providing the music. Prices were: divans 50 cents, other seats: adults 30 cents and children 15 cents. Talkies came to Ojai in 1930. “Ojai turned out in force Saturday night to greet the talkies just installed in the Ojai Theatre and indications were that the innovation will be popular with the film fans,” reports The Ojai on Feb. 14, 1930. In October of 1930, Fred Hart leased the theater to Oliver Prickett and George Damon, Jr., owners and operators of the Alcazar Theatre in Carpinteria. Prickett and Damon installed new lamps in the projection room making it possible to change reels without interruption on the screen. At this time the property included the theatre, Dr. King’s offices and the Busch grocery that were part of the property sale. Swanson proceeded to renovate the theater which included a new floor with a slope of five feet from back to front so better visibility is assured. The stage was removed making room for more seats, and a new enlarged screen of an improved beaded material was installed, along with rest rooms and a new box office. The first film shown in the newly renovated theater was Shirley Temple’s newest film, Curly Top. The Flesher Family bought the Ojai Theatre from Swanson in 1949 and owned it for several decades with the Lawrences. Also in 1949, it was reported in the local paper that Wilbur Jerger presented a series of silent films he called the Great Films Series but the attendance was low. He endeavored to get an annual film festival started in the valley that he wanted to call the Great Film Festival. It is unknown what became of Jerger’s idea but in 1988, a group of locals formed the Ojai Film Society that has now been showing independent and foreign films on Sunday for over twenty years. In 2000 the group launched the Ojai Film Festival, which after several years became its own entity and celebrated its 10th Anniversary in 2009. Through the years new owners upgraded and renovated the Ojai gem. One of the most dramatic renovations took place in 1966 when Wayne Glasgow took over the closed theater, changing the name to the Glasgow Playhouse and completely renovating the inside and out in an elaborate Scottish motif. Glasgow’s wife Anne traveled all the way to Scotland to acquire Scottish antiques. Billed as a theater that would only show movies for adults, the Glasgow Playhouse opened on June 15 and 16 with a premiere screening of Shakespeare Wallah–four months before its West Coast debut in Los Angeles. The first night’s screening was followed by a sumptuous champagne buffet supper served in the gardens of the historic Oaks Hotel (now the Oaks at Ojai.). Glasgow’s grand plans soon faltered. By June of 1967 the theater was already closed and didn’t reopen until January of 1970, according to the Ojai Valley News. The theater, not entirely out of Glasgow’s hands, opened under the management of Ted and Ruth Morris, owners and operators of the Los Robles Theatre on Maricopa Highway (open from 1964-1972, now Rabobank) and the Fox Theatre in Santa Paula. Ted Morris comments in the Ojai Valley News of January 28, 1970, “This is the most extravagant theater I’ve ever seen in a town this size.” Morris pointed out the handsome cabinets and soft reclining seats. Glasgow can best be described as a character and was dubbed Ojai’s “bad boy” in the 1970s, though friends considered him smart and entertaining. He was often in the newspaper for one reason or another. Glasgow eventually retired in Hawaii and died there in 2005. After a number of defaults, Glasgow eventually gained title to the theater. Ventura County records show a deed transfer from Ted and Betty Flesher to Wayne Glasgow in 1975. His troubles continued, however, and with numerous liens on the property, Glasgow was under court order in the 1980s to sell the property. The financially troubled Glasgow era ended in 1983 when Khaled Al-Awar, who weathered long and difficult negotiations with Glasgow, finally succeeded in purchasing the theater. In spite of his shaky reputation, Glasgow demonstrated his love for the theater by making sure it sold to someone committed to running the movie theater, something Al-Awar promised to do. Al-Awar, owner of the Primavera Gallery in Ojai, made repairs and improvements to the building and changed the name to the Ojai Playhouse. He also worked hard to get first-run films in to town as the theater’s reputation had been badly damaged. Al-Awar was also one of the founders of the Ojai Film Society. The Al-Awar family successfully operated the Ojai Playhouse until 2007 when Mark and Kathy Hartley took over the historic place and financed a major renovation, restoring the Isis to the glory of its early years in what they call an “early Hollywood” style. 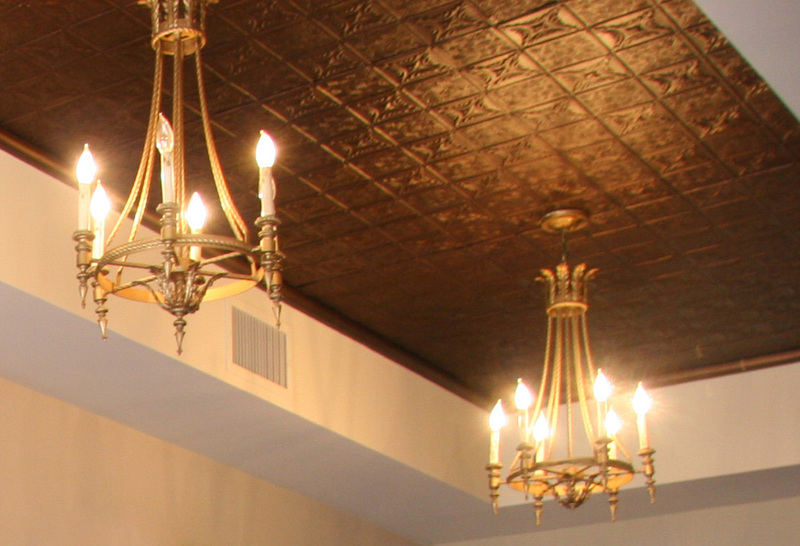 During the renovations the false ceiling in the lobby was removed and the original ceiling of ornate tin was uncovered. This may be the same ornamental tin mentioned in the May 29, 1914 article (paragraph 8 above.) The Hartleys changed the name back to the Ojai Theatre though the marquee still says Ojai Playhouse. What you see today as the theater lobby may not have existed in the early years and there are few around to remember. Old newspaper articles mention two other businesses occupying spaces in the same building. Helen Peterson, who worked at the theater from 1945 to 1950, describes a ticket booth that jutted out from the face of the building with double entrance doors on either side. The entrance was further east than today. Inside was a hall area with curtained doors to the right and left that entered the theater proper. Off to the right were restrooms and the Flesher’s theater office. She sold candy from the booth and there was no popcorn concession. Local historian, Terry Hill remembers in the 1950s a ticket window to the right of two double doors (see the post card photo from 1954.) He recalls a popcorn concession that was directly behind the seats on the other side of a wall. The Flesher & Lawrence Insurance business and Roy Roberts, Realtor were both listed in the Ojai Directory of 1954 as being located next door at 139 E Ojai Avenue (where The Jester is today.) Historian David Mason remembers that there was a waiting room with chairs inside to the right of the entrance. According to Hill, Wayne Glasgow constructed the new entrance and big lobby during his1966 renovation. 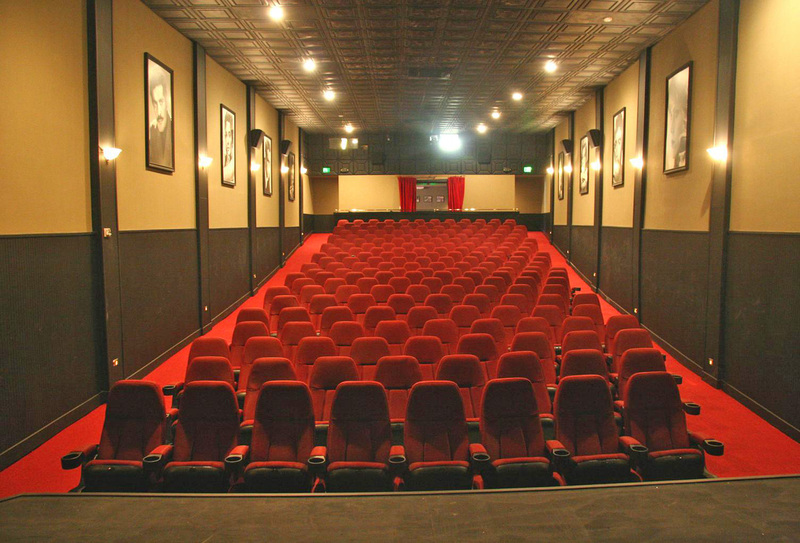 Americans love for movies has only grown over the decades and thanks to the Hartley’s, and all the previous owners, Ojai residents have a unique opportunity to view first-run films in one of the oldest single-screen theaters in the country. And though the theater was closed for periods, it has been continuously run as a movie theater for close to 100 years. Kathy Hartley comments in the Ojai Valley News in May of 2008, “One-screen movie theaters are dying all over the United States. The only way we can make it is with the help of the community. I’m hoping they’ll come back and support us.” Support our Ojai treasure–see a movie in Ojai. Keep the Isis alive! Ojai Theater Inside, Mark and Kathy Hartley renovated the historic theater installing comfortable new seats, new carpeting, wainscoting and other beautiful touches. 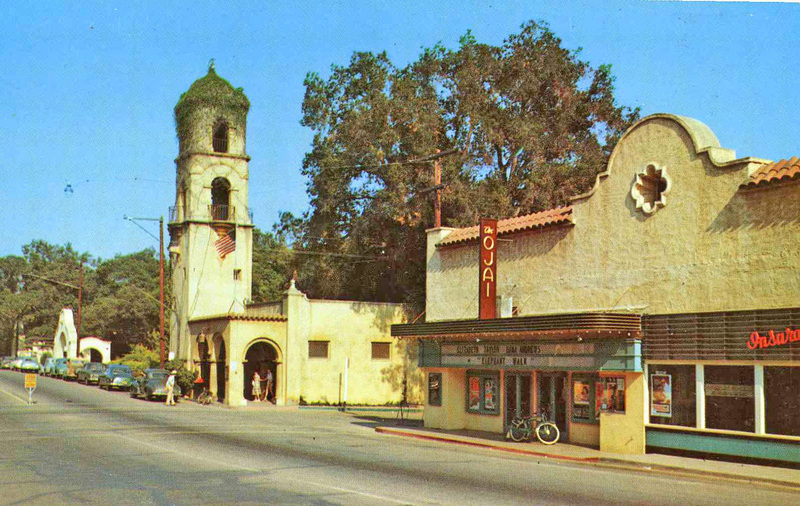 Note: Old photos of the Ojai Theatre are rare so if you have any please contact the Ojai Valley Museum at 646-1390. You can either donate the photos to the museum or loan them for scanning. Elise DePuydt is the Office Manager of the Ojai Film Society and author of A Photo Guide to Fountains and Sculptures of Ojai: Art, History & Architecture. Elise can be reached at redepuydt@att.net. The Ojai Theatre reverted to Khaled Al-Awar in 2010. He returned the name of the theater to the Ojai Playhouse. The city-owned Fillmore Towne Theatre is currently closed. I felt that Wayne Glasgow’s attempt to make that theater into a first class “art film” theater was magnificent. We were “regulars” there during the period (mid-60’s) when it was operating. Glasgow, as I recall, had real competition when a second theater was opened at the triangle towards Ventura. I was close friends with Ted Flesher and Barney Lawrence (brothers-in-laws and insurance partners) who held mortgage to the property and I recall that they were well-wishers for Glasgow’s success. For that short period, it was “classy”. I remember once he held an “Ingmar Bergman Film Festival.” I think he showed every Bergman film made. That was quite an experience for a high school kid in the 60s! My parents, John and Verna Thompson purchased the craftsman cottage at 108 S. Blanche Street from William Swanson in 1950. After Swanson sold the theater and the house I believe that he went on to purchase Paradise Cove on the Malibu coast. I recall that there were many film canisters left in the built-in bureau in the house and some movie posters. As a child, I enjoyed the Saturday matinees: double features, news reels, and serials: Flash Gordon and Abbot and Costello. How enlightening to learn more about the Ojai Theatre. I lived as a young bride and mother in Ojai 1946 to 1951. The first movie I saw at the theatre, that I remember, was “Gone with The Wind”. The aisles down the sides always intrigued me. So happy to know it still exists as a hall of entertainment. I truly applaud this insightful recap. I was a kid when the Glasgow Playhouse reopened in the ’70s, and I remember the unique aroma of lobby popcorn and mustiness the first time we went there. I also remember sleeping through most of “The Godfather” which my folks took me to see there, but I found incredibly tedious. The good thing about it was thirty years later, on a cold snowy day in the East, finally seeing the movie and feeling like I had discovered a cinematic gem.